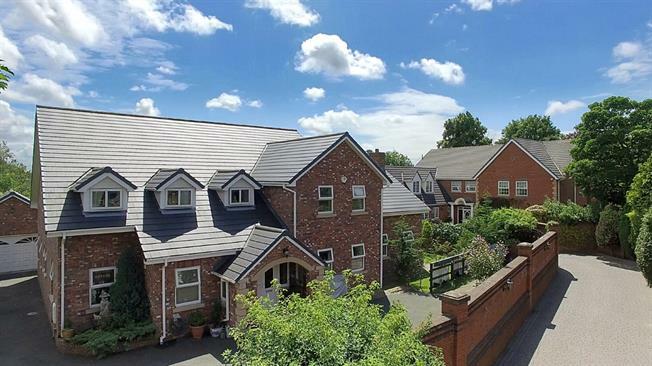 6 Bedroom Detached House For Sale in Liverpool for Offers in excess of £845,000. Entwistle Green Prestige are delighted to welcome to the sales market this quite magnificent six bedroom detached property located in the confines of Sandfield Park. This prestigious property boasts some magnificent features. In brief, the accommodation comprises, a cloakroom, office/snug room, sitting room, dining room, kitchen/diner, utility room, rear sitting room, six bedrooms, walk in wardrobes, multiple en-suites, a Jack and Jill bathroom, family bathroom, double glazing and central heating. The living space is vast and very well thought out. There is a homely and warmth about the property as well. Externally, the property is one of the best you will see. There is multiple car and van space to the front and side of the property plus a big garage all enclosed in a safe gated environment. There is also a wrap around garden offering great privacy. Please call our local branch on 0151 220 4443 for more information. UPVC double glazed door. Radiator, laminate flooring. UPVC double glazed door. Double glazed uPVC window. Radiator, tiled flooring. Granite effect work surface, fitted and island units, stainless steel sink, double sink and with mixer tap with drainer, integrated, electric oven, gas hob, over hob extractor, integrated dishwasher. Double glazed uPVC window. Heated towel rail, tiled flooring. Touch flush, pedestal sink. UPVC patio double glazed door, opening onto the garden. Double glazed uPVC window. Radiator, solid oak flooring. Double aspect double glazed uPVC windows. Radiator, laminate flooring. UPVC double glazed door. Double glazed uPVC window. Radiator, tiled flooring. Double aspect double glazed uPVC windows. Radiator, solid oak flooring. Double glazed uPVC window. Heated towel rail. Touch flush, double enclosure shower and power shower. UPVC double glazed door. Double glazed uPVC window. Radiator, tiled flooring. Granite effect work surface. UPVC double glazed door. Radiator and gas fire, solid oak flooring. Granite effect work surface, fitted and island units, stainless steel sink, double sink and with mixer tap with drainer, integrated, electric oven, gas hob, over hob extractor, integrated dishwasher. Double glazed uPVC window. Heated towel rail, tiled flooring. Touch flush, panelled bath with mixer tap, single enclosure shower and electric shower, pedestal sink with mixer tap. Double aspect double glazed uPVC windows facing the front. Radiator, laminate flooring. UPVC French double glazed door. Double aspect double glazed uPVC windows. Heated towel rail, tiled flooring. Touch flush, jacuzzi with mixer tap, single enclosure shower, pedestal sink with mixer tap. Double glazed uPVC window facing the rear. Radiator, laminate flooring. UPVC French double glazed door. Radiator, laminate flooring. Touch flush, jacuzzi with mixer tap, double enclosure shower, pedestal sink with mixer tap. UPVC French double glazed door. Double aspect double glazed uPVC windows. UPVC French double glazed door. Double aspect double glazed uPVC windows. Heated towel rail, tiled flooring. Touch flush, pedestal sink with mixer tap.